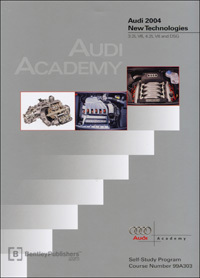 This Self-Study Program focuses on several Audi performance innovations that are new for 2004. Two fresh engine packages and a racing inspired transmission lead the list of exciting new products being offered in Audi models this year. A new 3.2-liter V6 engine rated at 250 hp is now powering the 2004 TT 3.2 quattro. A new, shortened 4.2-liter V8 is now at the heart of the sporty 2004 S4 and 2004 allroad quattro 4.2. Also new is the six-speed 01E Direct Shift Gearbox (DSG) that combines the best features of a manual transmission and an automatic transmission. The DSG is standard in the TT 3.2 quattro. This new technology and other enhancements, such as brake systems, will be covered in this SSP.